As I was setting forth into rereading Chapter 1 of The Hobbit, I started getting a sense of … remindedness. What was this chapter reminding me of? Aha! Now I know what it reminds me of: the opening of “Sir Gawain and the Green Knight,” which first looks far into the past — at the momentous event that caused a chain of consequences leading forward in time to the (still in the legendary past) event of the story that will be told. That is, it begins with the siege and assault of Troy and its smoking ruins, leading to Aeneas’s founding of Rome and the spread of its civilization until Felix Brutus, banished great-grandson of Aeneas, becomes the founder of Britain. All of this has nothing materially to do with the story of King Arthur’s court that the poet goes on to tell. It runs counter to common storyteller advice to start the story as quickly as possible. Well, it makes the story being told part of a larger story: in the case of “Sir Gawain,” part of the story of England, and in the case of The Hobbit, part of the larger world. That bit about young Tooks running off and having adventures is the beginning of that idea, and throughout the whole story of The Hobbit Bilbo is discovering the greater world, which is not yet called Middle Earth. This is a way of proceeding that was evidently instinctive to Tolkien, as can be seen clearly when we get the entire Lord of the Rings story which itself is just one part of a much larger story. This placing of a story in a larger context also gives Bilbo and Sir Gawain heroic predecessors and heroic standards to measure themselves by. Throughout the novel Bilbo repeatedly either brings up the Old Took, or the narrator does. The Brutus bokes therof beres wytteness. 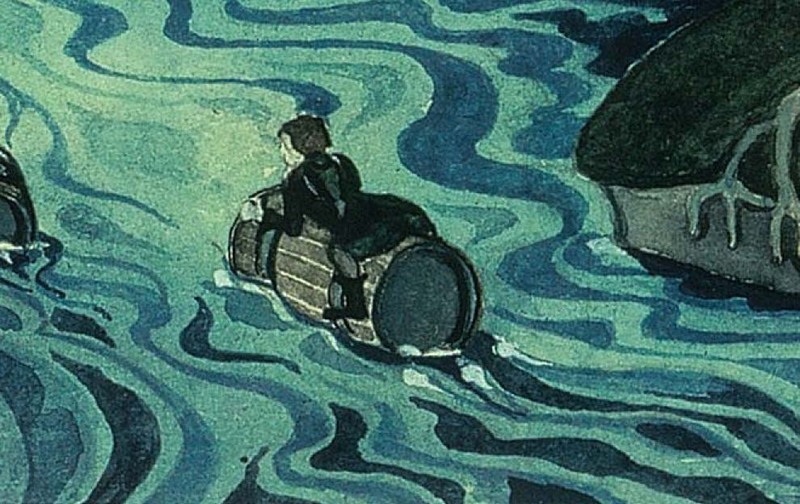 Tolkien’s illustration of Bilbo floating on a barrel after escaping from the Wood Elves’ dungeons. 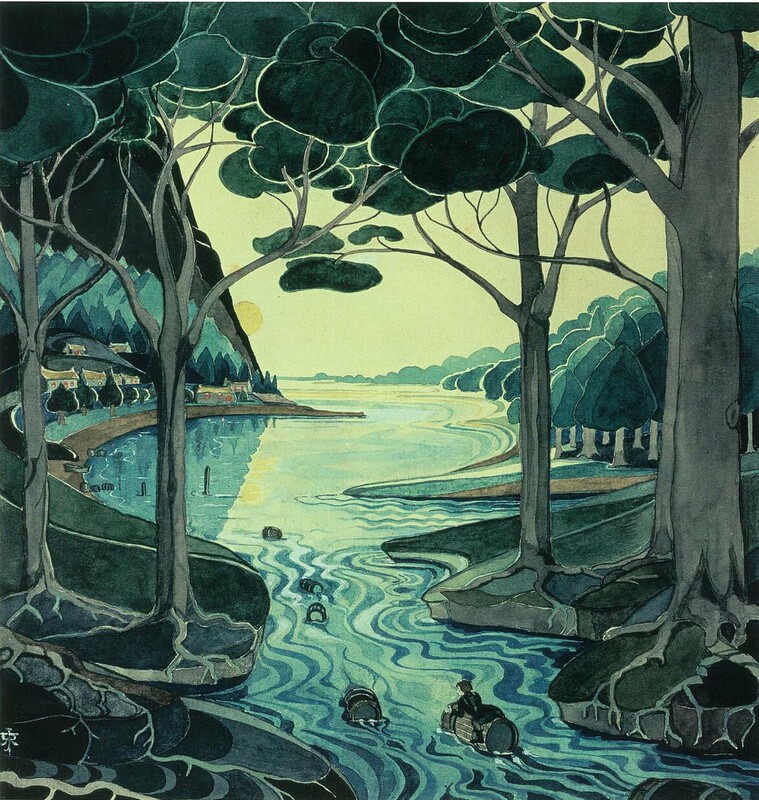 The Hobbit was published on Sept. 21, 1937 — 75 years ago today. Among all the penetrating and insightful tributes that have been written about this masterpiece, what can I add? They don’t. Our authoritative source says flatly: they “wear no shoes” (Hobbit, p. 10). But — and I make an important distinction here — do they wear boots? Closeup of Bilbo floating on the barrel.